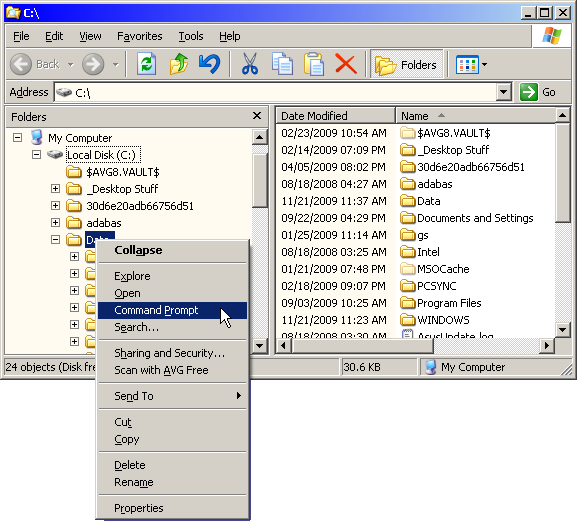 It’s handy to have an entry in the Windows Explorer context menu which will enable you to open a Command Window and automatically navigate to that folder. Here's how to create a Command Prompt entry on the context menus for both folders and drives. Similarly, this procedure will also add a VS Command Prompt entry (not shown in the screen shot below). Copy the following text into a text file and save it as C:\Data\VSCMD.BAT. cmd.exe /k cd /d "%1"
Copy the following text into a text file and save it with a .REG file extension. @="cmd.exe /k \"cd /d %L\""
Double-click the newly-created REG file to merge it into the Windows Registry. You should see the commands in the shortcut menu without having to reboot. On Windows 7, in order to see the new Command Prompt entry in the context menu, you must hold down the Shift key when right-clicking the folder/drive.